Over 75 different key blanks are routinely stocked for Volkswagen, plus many related small parts for Volkswagen door, ignition and accessory locks. Many hard-to-find key blanks are stocked in depth, with most other types readily available from both domestic and European sources. Volkswagen lock services include re-keying to match entire locksets, generation of keys by code number engraved on many Volkswagen locks and key generation and duplication. 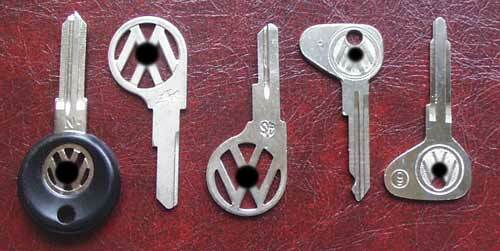 Steve's Lock Shoppe stocks many original VW keys by manufacturer such as Huf, Witte and Valeo. As availability on these older keys is ever-changing, please e-mail us for current availability. Many original keys are of steel construction, and require special cutting equipment not found in most hardware stores or locksmith shops. Steve's, of course, is equipped to handle these steel keys. For details on VW & Audi High Security and Electronic Chip keys, click here. Steve's Lock Shoppe provides services on all Volkswagen makes and models. Contact Steve's Lock Shoppe for specific information on services, pricing and shipping. E-mail Steve's Lock Shoppe by clicking here or call (936) 435-1324.